Patrick Mahomes II will take the field in the AFC Championship Game this weekend. He will try and end the Patriots dynasty, while trying to exorcise the demons haunting Andy Reid’s playoff past. Kansas City has been a fun club to watch with their explosive offense. Needless to say, this Sunday will be a career altering game for the quarterbacks on both sides of the ball. Twins fans have an obvious connection to Mahomes since his father played parts of five seasons in Minnesota. Let’s take a trip down memory lane to learn more about the elder Mahomes and his pitching career. Mahomes was taken in the sixth round of the 1988 MLB Draft out of Lindale High School in Texas. He was one of 10 players from that round to make it to the big leagues. Out of the players Minnesota took in the ’88 Draft, Mahomes was the lone draftee to play more than 75 games at the big-league level. First round pick Johnny Ard (20th overall) never made it past Double-A in the Twins system. He made his professional debut in the Appalachian League where he was over three years younger than the competition. In 13 starts (78.0 IP), he had a 3.69 ERA and a 1.50 WHIP with a 93 to 51 strikeout to walk ratio. Over the next two seasons, he moved through both Low-A and High-A with a combined ERA south of 3.30. He also continued to strikeout close to a batter an inning. As the Twins were on the way to the 1991 World Series, Mahomes was dominating at Double- and Triple-A. In his age-20 season, he had a 2.32 ERA and struck out 177 in 171 innings. He was nearly six years younger than the competition in the PCL. After the season, Baseball America would name him the 25th best prospect in baseball. Mahomes would split the next two seasons between Triple-A and the big-league level. He made his MLB debut on April 12, 1992 at the Metrodome. He was the sixth youngest player to play in the big leagues that season. In the first inning, he allowed a three-run home run to Juan Gonzalez with two outs. From there he settled in and pitched through six innings without giving up another run. Minnesota would tie the game in the seventh before Bob Kipper allowed the go-ahead run in the top of the eighth. The 1994 season would mark his only full season where he was used exclusively as a starter. He finished 9-5 with a 4.73 ERA. His nine wins were second on the team behind Kevin Tapani. Only four other players on the squad had a higher WAR than him (Chuck Knoblach, Shane Mack, Kirby Puckett, and Kevin Tapani). Over the next two seasons, he would start to transition to a bullpen role with the Twins. In August 1996, he was traded to the Red Sox for a player to be named later. Boston sent Brian Looney to Minnesota to complete the trade and Mahomes would be released by Boston the following June. Mahomes became a journeyman pitcher from that point on in his career. He would pitch in Japan for parts of the 1997 and 1998 seasons before signing with the Mets. In 1999, he pitched in four playoff games for the Mets before they eventually lost to the Braves in the NLCS. He’d play for an eye-popping 11 more organizations in his career including big-league time with the Rangers, Cubs, and Pirates. Mahomes continued pitching for multiple independent league clubs through his age-38 season. 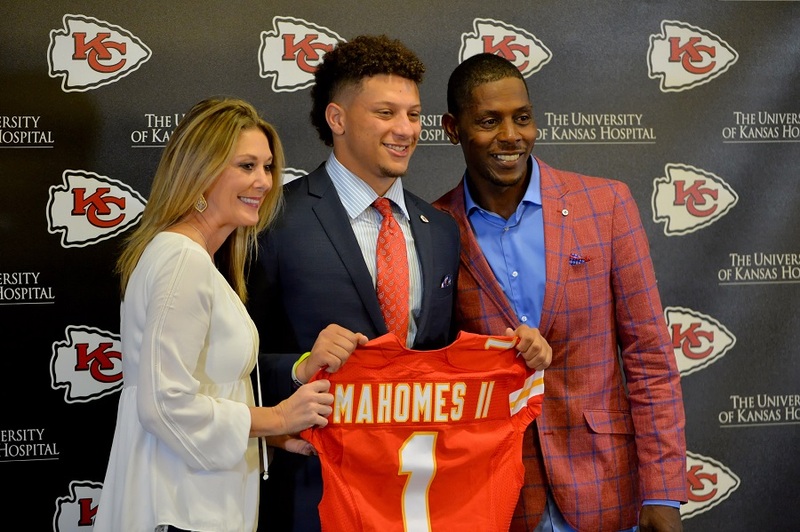 It’s clear to see the younger Mahomes might be finding more success in his chosen professional playing career. However, the young quarterback got some of his dad’s athleticism. The Vikings didn’t make the playoffs and you might be looking for a new team to root for this weekend. Why not cheer on Mahomes? It's hard to cheer for the Chiefs since they beat the Vikings in Super Bowl IV. Yes, I was negative two years old in 1970. However, the highlights of Chiefs coach Hank Stram yammering on and on still haunt my childhood and add to the torture of being a Vikings fan. For his career, B-Ref has Mahomes with -0.5 bWAR; Fangraphs has him at -3.0 fWAR. I thought Joe Kapp, Bill Brown, Alan Page, Carl Eller would find a way to beat the Chiefs in that Super Bowl. I liked some of the Chiefs players except Dawson. But Hank Stram . . . I always hoped a sideline play would crash in to him so hard he swallowed his clipboard. In 1992 I brought my family to Minnesota, where I grew up, from San Francisco. On our winding way, we saw a Portland Beavers baseball game on July 4, 1992. My recollection is that Scott Brosius beat the Beavers for the Tacoma Tigers. I want to say that Mahomes started for the Beavers in his up and down rookie season. I may be making that part up - I do that sometimes. I dug but can't find a box score. I remember Twins fans having high hopes for Mahomes. I think of him as a pitcher who threw hard but didn't fool a lot of batters. I was glad he had some success later with the Mets. You die hard Viking fans don’t let anything go! The way the Vikes play in big games you’ll be mad at the rest of the league! Yes, the list is quite extensive. The Chiefs, Falcons for 1998, Saints for cheating and Favre across the body just to name a few. It is neverending the grudges Vikings fan can harbor. So? It was Super Bowl XI against the Raiders. It was ugly. So ugly, one of the guys at our Super Bowl Victory (sic) Party throws a shoe at the TV, knocking it over, out and dead. Saved us the final misery. I knew right there I couldn't take any more, so that ended my football fandom. Though I did enjoy the Daunte Culpepper era because a lineman sized quarterback is fun. The Vikings have never won more than two playoff games in any season. With three playoff games required to make the super bowl now, we may never see them get there. Maybe it's for the better. I expect them to lose the big games now, and if they ever won it all I would probably be so shocked my heart would explode and that would be my last day on earth. It only takes 2 wins to get to the Super Bowl, with a first round bye. But it would be a GREAT last day wouldn't it? Yes. Although I wrote otherwise, I meant to write WIN a superbowl. I don't care much if they just get there. I was at Mahomes’ MLB debut. It was the first Sunday night ESPN game of the year and the first time they had one on opening weekend. Because of scheduled off days, Tom Kelly could have handpicked who would start. I always felt making his debut on the national stage was a huge mistake. Lead off walk. A flyout to cf by former Twin Al Newman. A balk and then another walk. A screaming line drive and then the big fly by Juan Gone. He probably should have started the Saturday game in between the home opener and the Sunday night game. He recovered just fine as mentioned. 5 shutout innings - against arguably the best offense in MLB - followed. The game was a foreshadow of the entire season. Starting pitching was not nearly as good as 1991. Offense was horrendous other than Puckett. Bullpen was terrible, including the usually reliable Aguilera. In Aggie’s defense, including the postseaon, he pitched 77 innings in 1991. That’s his highest career total as a reliever. So, what do people think of the comment he attributes to Jack Morris? Brother, I am sorry. If I didn't have the (increasingly distant) memories of 1987 and 1991 I don't think I could be a fan of Minnesota men's professional sports teams. Yes, just getting to a championship round would be incredible after such a drought. Keep cheering. Maybe someday this town will get another men's pro sports title. Until then, go Lynx! I've long wondered whether TK, Puck and Hrbek made a deal with the Devil back in the day: 2 World Series crowns for a lifetime of sports suffering. "You shall twice celebrate as world champions", Satan said, "but for the next 2 generations, should any of your local teams appear poised to win a third, it shall not happen.They may get close, but to a man, they shall fail spectacularly in the biggest of moments." And so when Satan came to enforce this unholy bargain on the Lynx, Maya Moore said to him, "Aha, but we are not men" as she calmly drained a 3 in his face. When I lived in Orlando I used to go to O-Twins games all the time. I was a big fan of Mahomes when he pitched for them. Always thought, or hoped, he would become a mainstay of the big league team's rotation. Oh well, that didn't happen. But very nice to see his kid doing so well in football. For many of us, born after 1976, that almost IS the curse -- not making it to the Super Bowl. 0-6 in conference championship games since then. Bullpen was terrible, including the usually reliable Aguilera. The curse of Eric Fox? With that said, I am happy to support Big 12 players once they become pros, so I hope Mahomes just keeps chucking TDs and I hope the Vikings get Mason Rudolph away from Pittsburgh (although when comes to football, I prefer the Big 12 over the pros). PS-Like many others on the list, perhaps the reason I somewhat abandoned pro football was because of the Vikings' miserable play on the big stage... especially when they are supposed to win (like when the Bears have nothing to play for so it should be a good tune-up for the Vikings' playoff start...). It won't last. Brothers and sisters are natural enemies! Like Packers and Vikings! Or Chiefs and Vikings! Or Saints and Vikings! Or Vikings and other Vikings! Damn Vikings! They ruined Minnesota! Some people enjoy reliving games from 50 years ago.Other people enjoy writing about the Twins 38th best prospect.